When Walt Disney was 16, he tried to join the Army, but when he was turned down, he lied about his age and signed on with the ambulance service of the American Red Cross. Why, you may ask? Because Walt Disney believed that the freedoms of this country were worth defending, so he chose the only way he could, at the time, to fulfill his desire to do his duty! On this Memorial Day, in the United States, it seems appropriate to look at ways that patriotism is represented at Walt Disney World. There are three items that jump to mind when considering this line of thought. Let’s take a look at those, now! In the Magic Kingdom, The Hall of Presidents is an obvious choice when considering how the US is represented in the parks at WDW. Based on Great Moments with Mr. Lincoln at the 1964 World’s Fair, the Hall of Presidents offers a look at every president who ever held office in the United States of America. And, it is in Liberty Square, so it’s easy to find. One of the coolest things about this attraction, is that it is one of the coolest places to cool off in the Magic Kingdom! 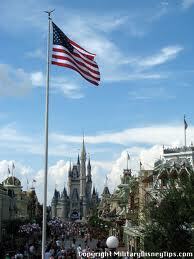 Also in The Magic Kingdom is the Flag Retreat Ceremony! This takes place everyday at 5pm and is the official retirement of the US flag for the day. The respect and care of this 10 minute event reflects the importance of the American Flag as a symbol of the freedom we have here in the states. It is an awesome experience, and I highly recommend it! Here is a YouTube video from Undercover Tourist of the Flag Retreat, http://youtu.be/cIOG1iln7S0 Enjoy!! Finally, we travel to EPCOT for the last attraction for today. The host pavilion for The World Showcase is also a giant representation of the patriotism and spirit of The United States. Of course, I am talking about The American Adventure! Most days, you can catch the Spirit of America Fife and Drum Corps. as they bring a unique sound to a couple of patriotic melodies. Inside, you will be greeted by the Voices of Liberty who will welcome you with beautiful harmonies that will raise the hair on the back of your neck, and raise a flag in your heart! It seems fitting on this Memorial Day, to look at the patriotism that Walt Disney displayed in his lifetime and the legacy of patriotism he gave us all through these experiences in the parks of Walt Disney World!